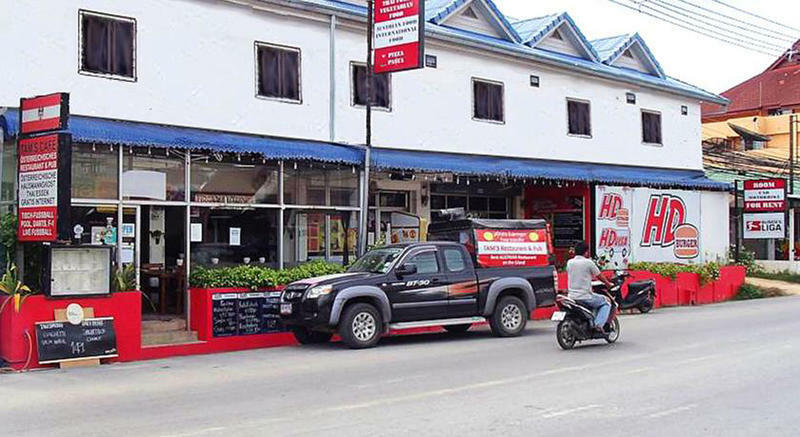 Tam's Guesthuse & Restaurant is situated close to the city centre on Chaweng Ring Road, opposite World Gym & 1.5 km from Chaweng Beach. Access to rooms is by a covered outside staircase and the dormitory by separate access at the front of the restaurant. The rooms are no smoking, though smoking is permitted in the bar/restaurant area and outside on the verandahs. Each air-conditioned room is fitted with satellite TV, fridge and minibar. Shower facilities are included in an en suite bathroom. There is also a dormitory style accommodation with 10 beds, fan , shared bathroom. For leisure, guests can enjoy a game of pool. Information on day trips can be found at the on-site tour desk. For exploring the local attractions, the hotel offers car and motorbike rental services.guests can enjoy a selection of drinks at the bar including many imported Bavarian beers. A wide range of Austrian, Thai and International dishes can be sampled at Tams Restaurant.